Manchester United have secured the young French Wonder-kid Anthony Martial for a fee believed to be in the region of £37 Million. The French "prodigy" has penned a 4 year contract with The Red Devils with option for an additional year. The previous world record was £31 Million for Luke Shaw, formerly of Southampton, which was broken by Manchester United in similar fashion. There are rumours circulating out of Monaco that the fee can rise by as much as a further 35 million euros which could push the Martial deal very close to breaking the British record fee.The extras are performance based add ons such as number of appearances and goals for Man United and then the same for the French National team and also including a very peculiar addition of winning the Ballon d'Or! Having started out his career at Lyon, Martial made his professional debut in a Europa League match against Hapoel, this was back in 2012 and Martial had just enjoyed his 17th birthday on the previous day. 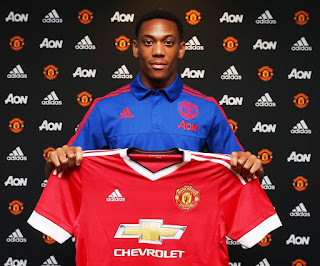 In 2013, AS Monaco paid Lyon €5 Million for the privilege of adding Anthony Martial to their roster. Since joining Monaco in 2013, Martial has notched up 32 appearances and scored 11 goals. Anthony Martial is a bit of an enigma, he rose quite prominently through the French National sides, being capped at U16/17/18/21 level right up until earlier this month when the French Coach Didier Deschamps included him in the squad for the upcoming International break. While most news outlets have got Martial down as a striker it is unfair to judge him as an out and out striker. Martial has played right across the front 3, he likes to pick the ball up on the wings and run at the defenders, sometimes cutting inside and finding the inside of the far post and other times just beating the defender and finding a man in the box. This season however, Martial has been deployed as a central striker for Monaco. He still sometimes drifts out wide to pick the ball up, providing that dangerous threat to the opposition as he is doing what he does best, bobbing and weaving. Martial is very eloquent on the ball, very reminiscent of a young Thierry Henry, the type of Henry that we saw at France '98. He can throw a trick in when needed and the talent is there but he has a lot of raw potential. With the right head on his shoulders and the right coaching staff, Martial can become a very, very serious contender for the best French player of his generation. He has been turning heads since the age of 15 when he started playing for the France U16 & U17 teams. Martial has blistering pace, he can absolutely catch pidgeons which is testament to his athleticism. A few days we ago we reported how Martial would be cup tied, however it turns out that UEFA actually allow a player to play in the 1st, 2nd and 3rd Qualifying round of a competition and then they can be re-registered for the main competition meaning that Martial will indeed be eligible to play for Man United in the Champions League. It is clear to see that most of the top teams have been courting with the young French starlet and similarly to when Manchester United bought Cristiano Ronaldo, one more season may have been too long to wait, giving other clubs the opportunity to pip them to the prize. You would have to say that Martial could fit quite easily into the Manchester United team. If Rooney was to drop back into the #10 position, Martial could occupy the central striker slot and latch on to any through balls deemed for him. Martial would also be very hand to have if Van Gaal wanted to change the dynamic of the team halfway through the match. At the drop of the hat, we could see Mata occupy #10, Rooney go up top and Martial play on the right wing. Whilst there are a lot of reasoning, I think it is safe to say that this deal should have been wrapped up a lot sooner. Martial will have gone under intensive scouting by Manchester United as the general consensus is that this is a panic buy for Manchester United in the wake of their 2-1 loss to Swansea. For what it is worth, rumour has it that Monaco wanted to see out their Champions League qualifiers before parting ways with Martial as they wanted the best possible team available to face Valencia.